Dynasty Typewriter has some New Year's Resolutions. First and foremost: Entertain and inspire as many people as possible in 2019! 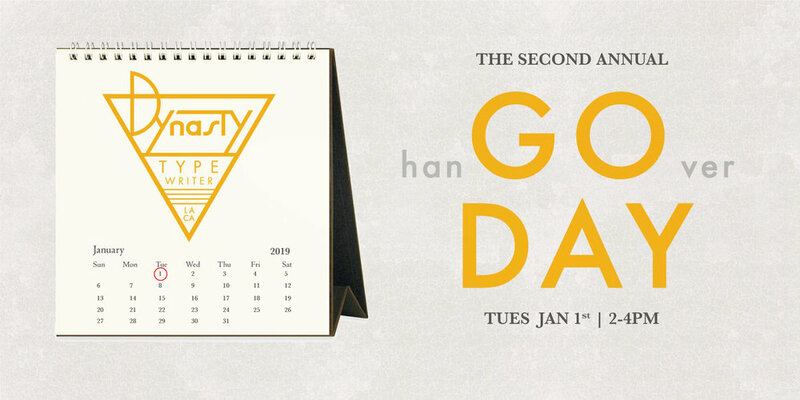 Looking to waste no time, we invite you to join us for our second annual GO DAY: an opportunity for artists to jump-start the new year with creative momentum, hangover be damned! 1) Some of our favorite creators (listed below) will share their approaches to effective goal setting and productivity to spark inspiration. 2) Work time. We'll provide curated workin' tunes at the perfect volume, a state-mandated stretch break, fully stocked bathrooms, enchanting footage of icebergs or forests may be projected onto the screen. 3) Celebrate! You did something and the first day of the year isn’t even over yet! This event is free to attend with RSVP.